TVB actress Eliza Sam (岑麗香) and her boyfriend of nearly two years, Joshua, tied the knot in a lovely ceremony held in Vancouver, Eliza’s hometown in Canada. Both Chinese Canadians, the 32-year-old actress and her husband started off the day with a traditional Chinese wedding tea ceremony, followed by a Christian ceremony in the Ebenezer Baptist Church. On Saturday morning, Joshua and his groomsmen arrived earlier to knock on Eliza’s hotel door, to play wedding door games. 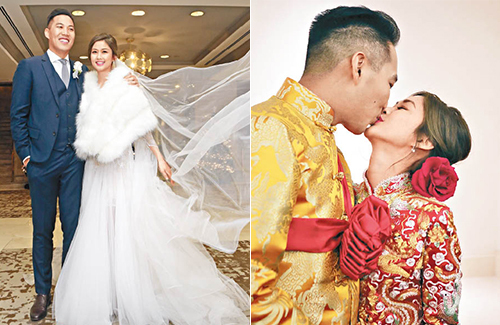 To take her hand in marriage, Joshua and his groomsmen had to be teased and tested by Eliza’s bridesmaids, which included Linda Chung (鐘嘉欣), Leanne Li (李亞男), Christine Kuo (苟芸慧), and more. One of Joshua’s last obstacles was to pick up grapes with his toes. After completing the traditional Chinese marriage ceremonies, Eliza and Joshua changed into their Western wedding outfits and greeted the press in front of their church. Eliza wore a white faux fur shawl over her wedding gown, while Joshua had on a gray black tux. Joshua was nervous meeting the reporters for the first time, and held onto Eliza’s hand tightly. Close family and friends were in attendance when Eliza and Joshua exchanged vows. Eliza was in tears when she saw both of their parents sitting among the crowd. Joshua quickly pulled out a tissue to wipe her tears. Around 4 p.m. the newlyweds and their guests arrived at the Fairmont Vancouver Hotel for their 30-table wedding reception. The venue was renovated into a princess’s lair, dominated with pink flowers and brown teddy bears. Eliza changed into her wedding kua to greet the reporters. She hung two golden pigs around her neck and golden bangles around her wrists, as per Chinese wedding custom. The newlyweds shared a few kisses and hugs upon the reporters’ requests. Eliza thanked the reporters for their blessings. She shared that she’s been too busy to plan for a honeymoon, but they plan to take short trip after their wedding. Joshua, who has been living in Vancouver all this time, plan to move to Hong Kong for Eliza. Smiling in bliss, the TVB actress said that they no longer have to go through a long-distance relationship. Children are in their plans for the future. Congratulations, Eliza and Joshua. Have a happy and everlasting marriage. Eliza looked super sweet and pretty in her wedding. Her wedding dress looks much better than the previous one. The next one might be Grace Wong because she’s also engaged. Congrats to them. Eliza Sam had quite a nice and luxurious wedding reception (30 tables as reported) at Fairmont Hotel Vancouver which is a very nice hotel in prime downtown Vancouver. What is Joshua’s last name? Did not seem to find it in the above article. aawww she is so cute! they are so cute ! congratz! eliza and joshua’s wedding feels so romantic. he seems to be very considerate too…whipping out a piece of tissue to wipe her tears and relocating to HK for her.